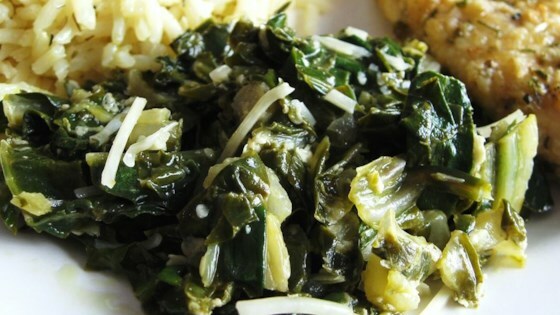 "Lemon and Parmesan cheese season this simple, tasty recipe for Swiss chard on your stovetop!" Melt butter and olive oil together in a large skillet over medium-high heat. Stir in the garlic and onion, and cook for 30 seconds until fragrant. Add the chard stems and the white wine. Simmer until the stems begin to soften, about 5 minutes. Stir in the chard leaves, and cook until wilted. Finally, stir in lemon juice and Parmesan cheese; season to taste with salt if needed. Not sure if it was the recipe, since it got great reviews...maybe chard is just not our thing. But this got a 0 from all five of us. A nice and healthy recipe for Swiss chard! For those who find it too bitter, try adding some heavy cream to the cooked vegetables.